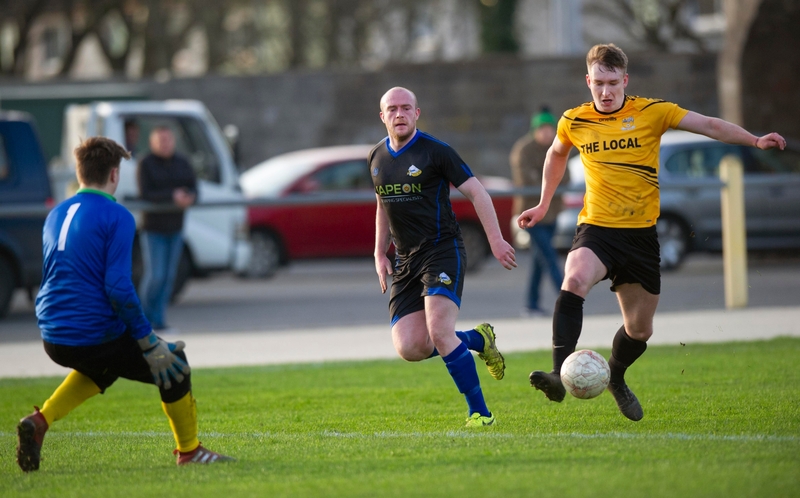 Clonmel Town warmed up for next week’s crunch FAI Junior Cup showdown with Dublin side Wayside Celtic taking all three points on offer against a determined Tipperary Town side in the Dr. Pat O’Callaghan Complex on Sunday afternoon last. Desperately needing points, the visitors took the lead in the 16th minute when Vinny Godfrey finished from a rebound, but the hosts were level just after the half hour mark, when Adrian Cleere played a ball into Evan McGuire’s feet and he controlled superbly before slipping the ball into a Conor O’Sullivan’s path and he bore down on goal and poked the ball past the oncoming keeper. Town went in front eight minutes from the break when Jamie Ahearne slipped past the full back and crossed to Evan McGuire who was waiting at the back post to nod home. Conor O'Sullivan (Clonmel Town) rounds the keeper to make it 1-1 in last Sunday's Premier League clash at the Dr. Pat O'Callaghan Complex in Clonmel. And McGuire scored his second goal to make it 3-1 five minutes into the second half when he curled a super free kick into the bottom corner, putting some space between the teams. Craig Guiry made it four just after the hour mark when he picked up the ball on the left and cut and shot past the keeper for a beautiful goal, but two quick fire goals from Godfrey in the final two minutes gave the hosts a huge scare late on. Clonmel Town held on however to move up the table while the visitors remain right in the thick of a relegation battle with games starting to run out now on them.